Preheat oven to 350 degrees F (175 degrees C). Coat a 7×11-inch baking dish with nonstick cooking spray. 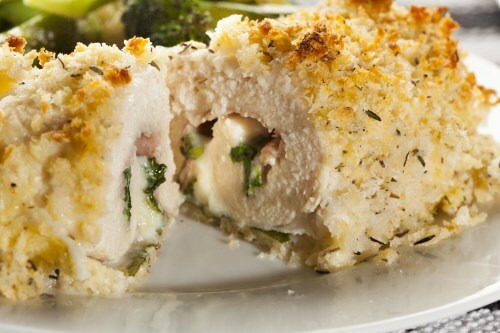 Pound chicken breasts to 1/4-inch thickness. Sprinkle each piece of chicken on both sides with salt and pepper. Place one cheese slice and one ham slice on top of each breast. Roll up each breast and secure with a toothpick. Place in baking dish and sprinkle chicken evenly with almond meal. Bake in preheated oven until chicken breasts are no longer pink in center and juices run clear, 30 to 35 minutes. An instant-read thermometer inserted into the center should read at least 165 degrees F (74 degrees C). Remove from oven, remove toothpicks, and serve immediately.